Paper size: 27 x 35.8 cm. 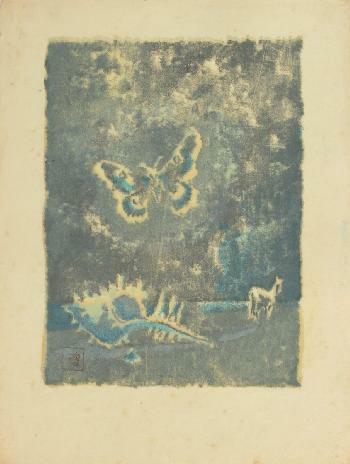 From set V of The First Thursday Collection (Ichimokushû), published in 1949. Titled and signed in sumi verso. Between 1944 and 1950 six sets of prints by different artists were produced under the supervision of Onchi Kôshirô. Fine impresion and colours, good condition: several faint foxing spots in the margin.